Thirty-three-year-old Kim walks up Rockaway Beach, calm and confident, her gold hoop earrings glimmering in the afternoon sun as the waves of the Atlantic slap the sand behind her. Dressed in a halter-style bathing suit top and corresponding bottoms, Kim looks like any other beachgoer relaxing on a Sunday afternoon, but the soft, eight-can cooler hanging from her right shoulder and the fact that she is alone sets her apart from the sunbathing masses. Kim is here to work, pacing up and down a short stretch of beach selling Nutcrackers, or bottled rum punch, saying the word out loud to no one in particular. Still, she grasps the attention of countless sunbathing, magazine-flipping, and “Despacito”-blasting New Yorkers, ready to fork over cash for a mysterious neon concoction in a chilled plastic bottle. Kim is just one of dozens (if not more) Nutcracker vendors who claim New York’s public parks, beaches, and street corners as their storefronts in the summer. Kim tucked the bill I handed her somewhere I didn’t even notice (her bathing suit? The cooler? Did I even pay her? ), and explains that that’s the key to her success: Never letting the exchange of money become visible. 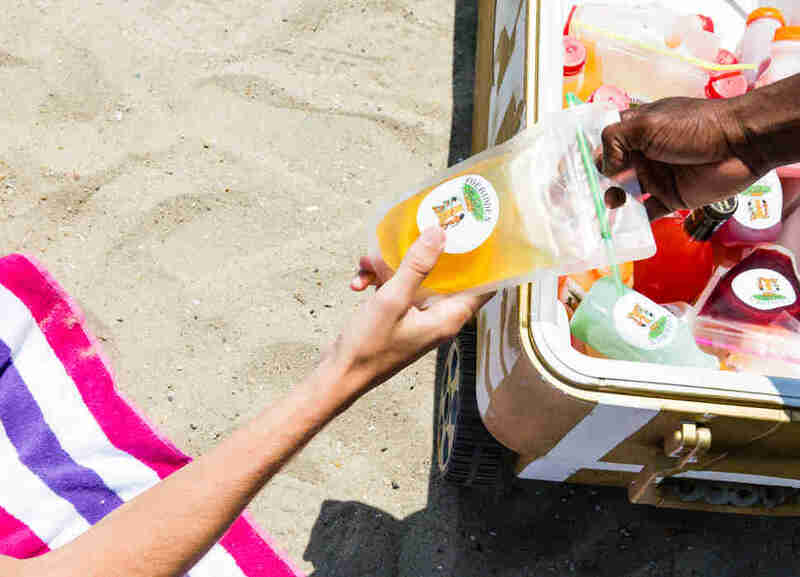 While New York’s open container laws technically ban drinking in public, you won’t get arrested for cracking open that plastic container of booze -- at worst, you’ll be issued a summons and have to pay a $25 fine. New York State, however, insists that all homemade foods available for purchase are made with permission from the Department of Health and city guidelines mandate a license to operate as a street vendor. Those operating without the proper paperwork and permissions can be subject to heavy fines or even arrest, and though selling alcohol without a license is also illegal, it’s extremely rare that Nutcracker vendors face any trouble with police. One vendor I spoke to said he worries about getting tickets, though he used to sell water at the beach and worry about the same thing (only now, with booze, he turns more of a profit). To keep cops from paying attention to her, Kim shuffles back and forth all afternoon to “headquarters” (a ambiguous destination she pointed to, northwards -- most likely a car or an apartment near the boardwalk), only carrying small amounts of product on her at any given time, to avoid suspicion from ATV-cruising NYPD patrollers on the beach. Because she’s out on the beach almost every summer day, she also changes up her look on a regular basis, accessorizing and dressing differently each day, to avoid unwanted recognition by authorities. 2017 marks Kim’s third summer selling Nutcrackers at Rockaway, and she has yet to encounter any trouble with authorities. In fact, the only people Kim knows who have gotten caught illegally selling booze are men who were being “stupid” (i.e., drawing attention to themselves by shouting loudly about what illicit products they have for sale or carrying suspiciously large coolers while walking alone on the beach). She was the only female vendor I saw selling punches on the beach. There is also an unspoken racial component: Every Nutcracker vendor I met or saw was a person of color, while everyone in my line of sight at the beach (and, according to other customers and vendors I spoke with, on most other NYC beaches) purchasing Nutcrackers in public was white and pretty much immune to the riskiness of conducting in a below-the-law business. 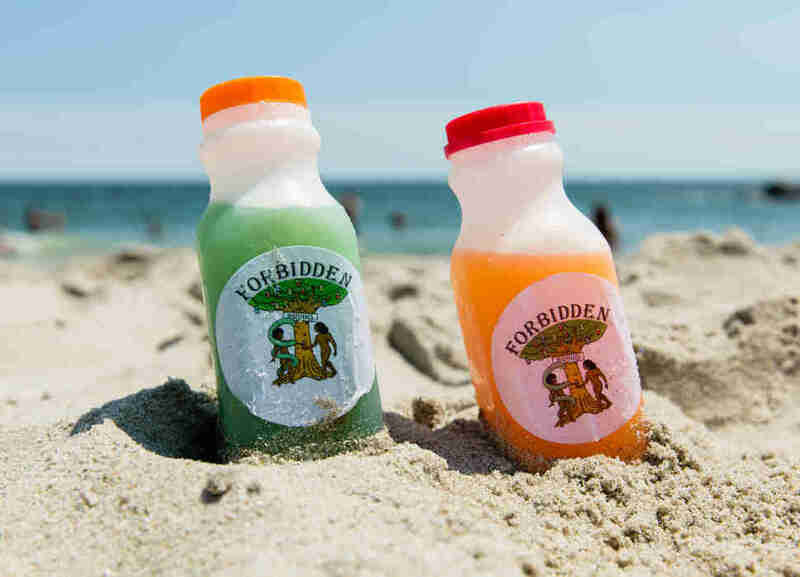 One beachside Nutcracker purchaser, 25-year-old Caitlin from Brooklyn, told me: “I know it’s such a risk, but YOLO,” on her decision to openly buy the illusive booze. She said she also purchases beer, water, and loose cigarettes from beach vendors, but prioritizes indulging in at least one Nutcracker every time she hits the beach. “I love the Nutcrackers because they make me really feel like it’s summertime.” There’s a vendor at Brighton Beach Caitlin seeks out every summer, though she doesn’t know his name. While Kim’s elixir tasted like it was poured from an orange Gatorade tank in a frat house basement (I can’t impartially judge its booziness, as I had a few cans of wine before imbibing), not all Nutcrackers are created equal. In fact, “Nutcracker” is a layperson’s term originally created to deceive cops -- or at least not draw attention to the fact that budding entrepreneurs and side hustlers were selling unpermitted boozy drinks in public spaces. A Nutcracker (or “grown folks’ juice,” as one vendor in Central Park called his neon green beverage) can be anything from cheap knock-off Kool Aid mix swirled with water and Everclear to a thoughtfully mixed, frozen, and rainbow-layered masterpiece of mixology retailing at $40 a pop. That’s what 26-year-old Jason, a Queens-based semi-pro football player and aspiring entrepreneur sells. Unlike Kim, Jason runs a one-man business, handling everything from purchasing to mixing drinks to selling his product completely solo. After hearing about Nutcrackers from his friends three years ago, Jason went to Target to load up on Mason jars and try his hand at selling the illicit cocktails. 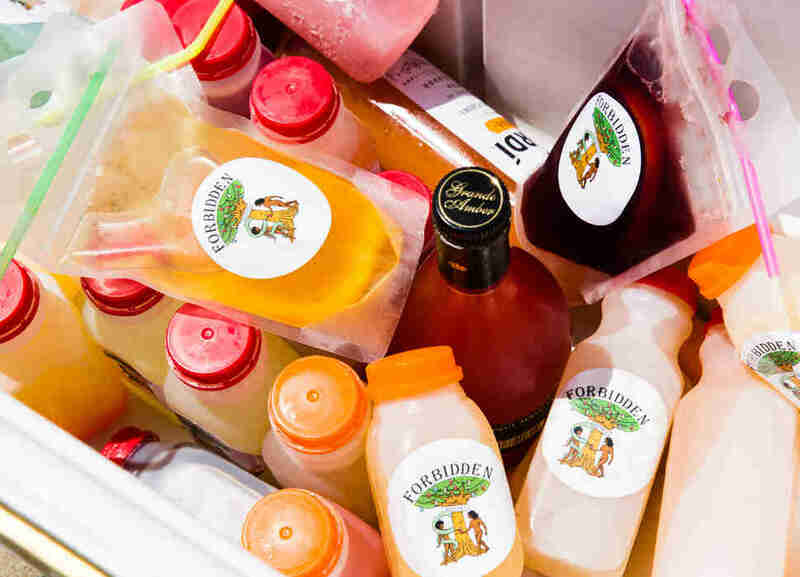 With his leftover ingredients, Jason “freestyles” to create new, on-trend creations, like a frozen Galaxy Punch, a multi-tiered rainbow drink, frozen boozy popsicles, and, most recently, a bag of spiked juice with a colorful straw, resembling an adult Capri Sun. “It’s all about the look,” Jason said. Originally branding himself as Empire Drinks, Jason renamed his business Forbidden Drinks earlier this season, showing his goods off on Instagram (where we originally connected) with photos and videos of attractive customers being impressed with their first sips (he doesn’t show his face or any definable characteristics on this account to protect his identity, though he does share the account on his personal page). He also had a local tattoo artist design a logo for his brand and is ordering stickers to put on each bottle to verify the higher quality of his product. Jason also works part time for an airline, unloading luggage at night at LaGuardia Airport, and splits his summers between that job, traveling for free (a perk of the job), participating in a small business program, and, on Fridays, driving out to Nassau, Long Island, to a liquor wholesaler to spend $100 on booze for a week of sales, which can lead to $200-$500 in profits per day, depending on business (he won’t give exact numbers). Jason sources his plastic containers from a top-secret vendor in Brooklyn, who offers an unbeatable deal of 500 containers for $100 (including sales tax) and, when he’s not delivering custom orders (placed via Instagram DM or text) out of his car, he uses a cooler he designed himself to vend his signature products at BYOB backyard parties, beaches, and sports games. Jason’s customers range from his colleagues at the airport to beach-goers and social media followers, of which he’s trying to gain more. During football season, Jason also sells at semi-pro games. When selling at night, he’ll use his phone as a flashlight in his cooler to lure in potential buyers. Much of Jason’s business comes from return customers and personal referrals who know his Nutcrackers are, as he attests, “the best around.” Keeping an eye on the competition, Jason will lower his prices in crowded markets (say, the beach), if necessary, building a loyal network of Forbidden Drinks devotees who slowly break into the $20 and $40 drinks Jason has created himself. 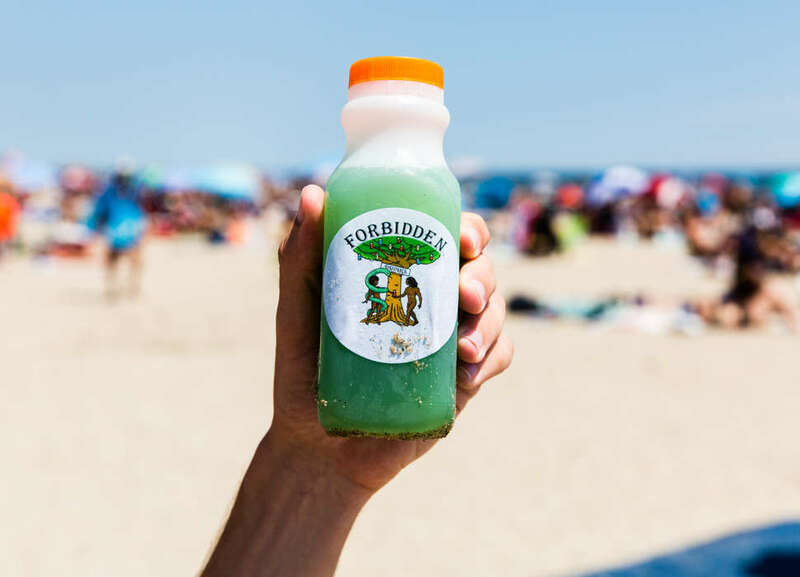 To vend to beachgoers, Jason will casually walk around with a Nutcracker in his hand, signifying to those looking to purchase the illicit drinks that he’s in the know. He has yet to have any trouble with the cops, though an officer once asked him to open his cooler at the beach. Thinking ahead, he’d already topped the cooler with Gatorade and water acted like he was packed to spend a day with his friends on the sand. Can Nutcrackers lead to more lucrative entrepreneurship? While Jason has multiple income streams, he sees Nutcrackers as potentially becoming his livelihood. “It’s worth it -- it’s a whole lot of money for a side hustle,” he said of his growing hobby. “But I’m moving up real quick.” This June, on his first trip back to Jamaica since he emigrated to the Bronx in 2001, Jason insisted on paying for everything for his family. This ability to earn, and give back, keeps him motivated. Though he tries to be realistic, Jason also “thinks big,” envisioning one day opening a Nutcracker Lounge, which would serve a variety of his signature creations, along with wings and other backyard barbecue foods, hosting events like Seafood Thursdays and perhaps mixology competitions. He hopes to learn more about the industry by investing in a franchise restaurant first. Attempting to move the Nutcracker phenomenon into the law-abiding realm, Jason is currently applying for a park permit to host a Nutcracker party, where different Nutcrackers sellers can show off what they make and compete for the top title. If the permit doesn’t work out, a backyard will do. After all, Jason knows who makes the best Nutcracker, and he’s ready to cut a deal ($50 for free delivery, plus two free small Nutcrackers) to anyone eager to try them. Melissa is a writer based in NYC who consumes a lot of grown folks juice. Follow her on Twitter and Instagram.